Bravo to all new executives. Bravo to us, HTC, for selecting our next leaders. Created in 2008 at the behest of then Chairmain of the Church Committee, Thomas Nchotu(RIP) and inspired by his support and efforts to get youth involved in the Cameroon Catholic Community in Washington DC, the founding members (Fausta Tabe, Gaelle Nchotu, Innocent Ongey, Nicodemus Kang, Maryanne Enanga, Stephanie Mouapi, Rosemary Nkuna, Kathleen Chofor, Bertrand Ndze, Yvette Chop, Jeanne Menchata, Yvette Fornishi. Laurette Femnou , Jackie Jua, Elvis Akwao, Emmanuela Tabe and Yvonne Fornishi) first met in Riverdale to start a choir. First called the Youth Choir of the CCCWDC, the choir first participated in the Liturgy two months after its creation. It became a regular at Cameroon Monthly Mass with most of its activities centered around the summer season since most of its members were students and living out of state. The choir changed its name to Living Christian Singers (LCS) briefly in 2011 before eventually voting to become the Holy Trinity Choir under its first Executive Director, Nicodemus Kang who was succeeded by Kathleen Nkemku in July 2012. The Holy Trinity Choir grew to its largest membership roll in 2015 under the leadership of its third Executive Director, Lionel Bongkiyung. The first patron, Eric Awambeng(RIP), worked to bring a recognized structure and the Holy Trinity Choir, under the guidance of its Spiritual Director, Fr. Emmanuel Fale, ratified a set of bylaws in summer of 2012 making official its name, identity, and structure as well as member obligations and code of conduct. The Holy Trinity Choir’s motto is: Qui Cantat, Ora Bis. An English translation of which means, whoever sings, prays twice; in other words, singing is praying twice. The patron Saint is St. Charles Lwanga. 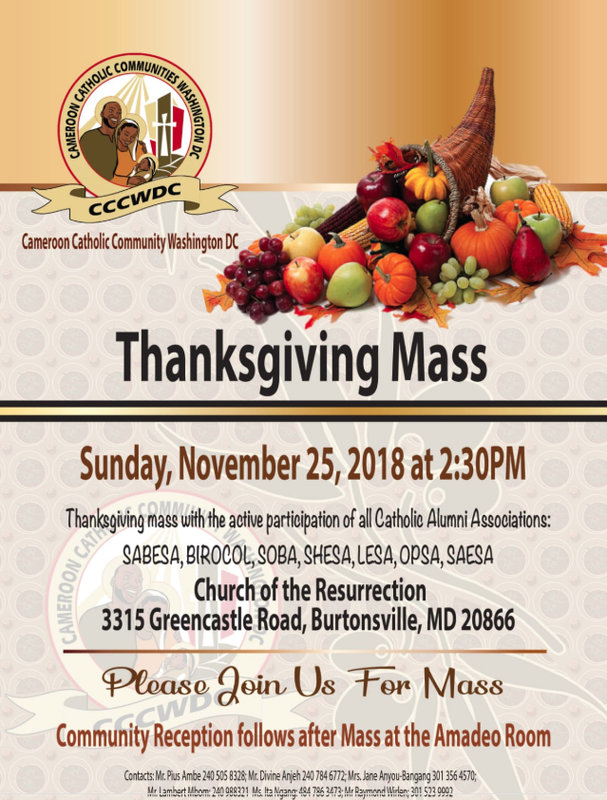 Exponential growth in talent and maturity of the members has brought about huge acclaim and the HTC members continue to impact each other individually in their spiritual life as well as the Cameroon Catholic communities in Burtonsville, Fairfax and Baltimore. The HTC has celebrated two Feast Days of the Solemnity of the Holy Trinity since officially becoming the Holy Trinity Choir and in 2015, during only its second Feast Day, and with the help of the community, the choir was able to raise more than double a projected amount at a fundraiser intended to raise money to acquire robes for all its members. The Holy Trinity Choir continues to participate in the Pastoral Council sanctioned events within the Cameroonian community as well as other community events across the DC Metro area and remains very committed to its Liturgical obligations at the Cameroon Catholic Community Washington DC and has performed at many community events, recently winning an award at the Resurrection’s Got Talent singing competition organized by the Knights of Columbus. Mr. Felix Anoma is the current Patron of the Holy Trinity Choir.